Picture from the Universal Orlando website. In a little over a month, Nicole and I will be heading back to Florida to look at potential apartments and attempt to avoid bug ridden slums. It’s quite frustrating evaluating apartments online, as one can find a website with great photos and glowing comments about a place, and then find a seething tempest of hatred in the reviews by former tenants. We’re not looking for the most spectacular apartment ever, just one that is affordable, safe, pleasant, and big enough that we can actually fit our stuff this time. Winning the lottery would certainly help in this search. Our current plans have us leaving on October 9th and spending 3 days and 2 nights searching the area around Orlando for decent living accommodations. This process is going to be a bit exhausting, I’m sure, and possibly even a little stressful. I’m hoping it will go smoothly, but apartment hunting is a tricky, unpredictable business. Since this is technically a vacation for Nicole, as she’s using vacation time, I didn’t want to make the entire experience exhausting. I mentioned before that I wanted to visit the Universal Studios Parks in Orlando, and one of the features they constantly advertise is the Universal Express Pass. This pass allows you to get to the front of most lines in the parks, and avoid the long waits for rides. Usually this costs a good deal of money, but it happens to come “free” if you stay at one of the official hotels. The catch is that none of the official Universal hotels can be called a value resort, or even a moderate like at Disney World. These are all deluxe hotels with deluxe hotel prices. Usually, I’d balk at the prices and find some alternative for the entire stay. However, Nicole and I have both had a very long year, and things are going to be just as hectic after our trip up to the move and beyond. Thus, I decided it was worth splurging for a few nights, and experience first class for the first time in a long while. 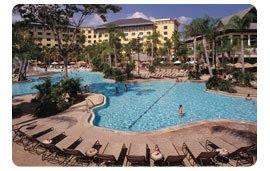 We decided to stay at the Loews Royal Pacific Resort. Island themed and laid back, it seems like the perfect place to relax a few days while touring the parks. The pool even has a sandy beach, something I’m sure Nicole will be thrilled to use. The hard part will be dragging her away to get her inside the theme parks. We’ll be capping our trip with a quick visit down south to see Nicole’s aunt, who lives near the Gulf coast. Unfortunately, her aunt works nights, and will not see us much, but at least we’ll get to visit and maybe get to see the beach briefly. After one night there, we will depart again for Indiana, though Nicole continues to threaten that she’s going to just stay down there and wait for me to come down from Indiana with all of our clutter. That’s the plan so far, at least what we have. We may only have one hotel booked out of two, and no plane tickets, and no anything else, but at least we have more of a plan than even a week ago. Let the preparing and planning continue.